The world’s most ambitious and biggest social inclusion program is underway in India, leveraging a massive array of public and private entities, sophisticated biometrics and information technology, and endorsement across political lines. Aadhaar, which means “foundation” or “support” in Hindi, aims to provide unique identification (UID) numbers to some 600 million Indians in the next four years, and cover the rest of the country’s population in subsequent years. Aadhaar’s driving force and chief evangelist is its chairman, Nandan Nilekani, one of India’s most visible new-age entrepreneurs who co-founded the country’s second-largest IT services firm, Infosys Technologies. In late September, Ranjna Sadashiv Sonwane, a tribal woman in Tembhali village, some 270 miles from Mumbai, got India’s first UID number that will enable her to open a bank account, secure a ration card, a mobile phone, health insurance or a home loan. Sonwane is among hundreds of millions of Indians who do not have authenticated identities acceptable to providers of all manner of public services. Their Aadhaar numbers will free them from the “poverty premium” — or bribes — they pay to access everything from food, jobs and loans to cell phones, and help plug an estimated US$110 billion that will be siphoned from US$250 billion in government spending for the poor in the next five years, according to a May 2010 report on the UID program by CLSA Asia-Pacific Markets, part of the Credit Lyonnais group. The Aadhaar program will also spawn business opportunities totaling US$10 billion in areas including consulting, IT services, hardware and training over the next five years. This is expected to double in the “second wave” in the subsequent five years, the CLSA report predicts. The Unique Identification Authority of India (UIDAI) itself has an approved budget of Rs. 3,023 crore (US$682 million at an exchange rate of Rs. 44.3 to a dollar). Nilekani says he responded to an inner calling and a “public-spirited” family trait when he accepted the five-year assignment with the UIDAI. The Indian Institute of Technology graduate also brings loads of technological prowess and a track record in executing complex projects competently. His lean team of a little more than 50 people includes several similarly inclined Silicon Valley entrepreneurs and corporate executives besides handpicked government bureaucrats. He has also enlisted support from multiple stakeholders including various political parties, government agencies and their bureaucrats, and businesses that will make up Aadhaar’s ecosystem. Nilekani has kept his task simple: provide identities for Indian residents and authenticate them on request, and demonstrate its power of inclusion in two areas — financial services and mobile subscriber verification. Nilekani’s compatriots and critics acknowledge his speed and urgency — he met, made presentations and signed up support from every chief minister and chief secretary in the country’s 28 states and seven union territories including visiting 24 states in 87 whirlwind days after he took on the Aadhaar job in July 2009. He made time at his Bangalore home recently for an interview with India Knowledge@Wharton. Below is an edited version of the conversation. India Knowledge@Wharton: What is the most striking aspect of this whole effort? Nandan Nilekani: Certainly the scale of this project is humungous. That actually was one of the first things we grappled with — how do we do this on such a scale? The model which we came up with in some sense provides us the wherewithal to do it at this scale. We said very consciously that we would essentially operate the number-issuing authority, but the actual enrollment would be done through a lot of partners. Partners, in our terminology, are registrars, like state governments, banks, insurance companies, oil companies and others. The fact that we have multiple partners, each of whom has a certain constituency, and the sum of all our partners in some sense should by and large cover the whole population — [that] gave us the leveraged model to reach everybody. That choice of the model has been a critical part of figuring out how to get the scale. One option would have been to create our own organization to do this. But this partnership model where we create an ecosystem and supplement that with cookie cutter technology is the differentiator. There are many programs where the executing arm is typically the state government, but we are providing the entire technology platform for this. The enrollment software, processes and hardware are all provided by us, or the specifications for them are provided by us. Therefore, the enrollment station behaves in the same manner, wherever it is. Whether you are enrolling a worker for NREGA [an employment guarantee program under the National Rural Employment Guarantee Act] in a village in Bihar or you are enrolling a customer in a bank in Nariman Point [in Mumbai’s financial district] or you enrolling an LPG [liquefied petroleum gas] customer for an oil company in Mysore [near Bangalore], the enrollment process all three of them follow is identical. So, creating the “templatized,” standardized software and process is actually the key to scalability. That, I think, is fairly unique. India Knowledge@Wharton: Data security and privacy concerns have been raised by Aadhaar’s critics who worry about how it can avoid leaks, duplication, fraud, etc. How well are you prepared for all that? Nilekani: There are certain design features which enhance our ability to do that. The first thing is when the data comes from the enrolling agency, it comes fully encrypted. Nobody in the chain of enrollment really has access to the data because it is encrypted at the point of collection, and only we can decrypt it when it comes to us. There is nobody in the middle who can do that. So that is one way of protecting the data. The second feature is, once the data comes to us and the numbers are assigned to people, the data doesn’t go out again. The only further use of this data is online authentication. You come to us and say, “I am so and so, my number is 123 and here is my authentication token” — it can be biometric or a pin [number] or whatever — that packet is sent to our server and it will come back with a response that this set matches this number and name or that they don’t match. So the only answer you can get from our system is a “Yes” or a “No.” You can’t read our database. We have made the database into a sort of a black box. The third feature — and it is a key value proposition we have to offer — is that by using sophisticated biometric matching and large scale computational back-end, we are able to establish your uniqueness as a person, and make sure you don’t get more than one number. So the fact that we are going to give you a unique number and only one number is at the heart of our value proposition. India Knowledge@Wharton: When you designed this, you must have looked at systems elsewhere in the world. What can we learn from things they have done right or done wrong, either in the U.S. or elsewhere? Nilekani: A lot of thought has gone into that. The U.S. Social Security number system was designed in the forties after the Social Security Act and the New Deal. We are designing an identity infrastructure in today’s age, and therefore, we have to see what is it we have today from a technology perspective which allows us to do things they could not when they designed it 60-70 years back. One of the things that struck us isthat the best way to do de-duplication — to make sure that somebody is unique — is the biometrics route. Biometrics in the West has advanced in the last decade and has primarily been driven by a lot of applications in the surveillance and the security areas. What is distinguishing about what we are doing in India is this is the first use of biometrics on a large scale for a developmental purpose. That is, how do we use this technology to give unique identities to millions of Indians who don’t have an identity? That’s a fact on the ground. How do we then use this online authentication of identity to provide the foundation for the reengineering of public service delivery — to make it more efficient, equitable and more effective? That, to our mind, is what is special about this project — the use of today’s technology and computing horsepower and biometrics, but finally for a developmental purpose, to give an ID to a large number of Indians who don’t have any papers or an ID, and then lay the foundation for the reengineering of public services. India Knowledge@Wharton: What is the biggest challenge you have to deal with? Nilekani: In the last one year, one big challenge has been in creating the ecosystem of partnerships and aligning everyone behind this — signing up registrars (registrars are banks, insurers, state governments and others who will enroll Aadhaar beneficiaries), getting them to think of how it is a win-win for all and so on. The second thing in the last one year has been the technological challenge. This scale of the use of biometrics for identity has not been done anywhere in the world. So in many ways you are at the frontiers of technology — something like a moon shot. You are saying you want to do something and then you are digging out all the possible ways to get there. By and large, we have been able to get over the technological challenges. Now, the challenge will shift to actual enrollment. There it is a question of logistics, process efficiency, data quality, making sure that wherever a person is given an ID number it is given with high quality and so on. So the challenges in the last 12 to 14 months are different from the challenges in the next 14 months. It is basically about how we execute enrollment at a high volume, at low cost and high quality. India Knowledge@Wharton: You have secured the buy-in from the various participants. Was it difficult to secure that? Nilekani: Yes, now we have a broad consensus among all the stakeholders. You have to use a lot of tact. Like any other evangelization process, you have to have a clear vision of what you are going to do, articulate that vision and sell it to them: Why it is mutually beneficial to be partners? We had to create the win-win argument. You enroll people into our system and in return for that you get the following benefits: You are able to cleanup your databases; remove duplication so you can become more efficient; you get online authentication of identity so you can streamline your public services, be inclusive and reach out to the poor, and so on. For each of our partners there is a set of benefits. Defining this mutually beneficial value proposition and getting them on board — that was the big task. It is like any other large change management program, where you need to get a lot of people on board. India Knowledge@Wharton: Did you face serious obstacles from any quarter — politicians or other critics? Nilekani: If you look at the scale of the program, the opposition has been from a very small segment. I mean there are a lot of emails, but fundamentally it is from a very small group. Politically we have a very broad based, bipartisan support; every state government in the country has signed up with us — of all political hues. We have support from parliamentarians, chief ministers, banks, etc. Otherwise, we wouldn’t have come so far. India Knowledge@Wharton: What has been the most credible criticism you have faced from any quarter? Nilekani: There are a few people who have raised their voices, and that is a natural thing. In any democracy when you are undergoing a certain change, a change which has as many benefits as we have, some people may feel that it is not the right thing to do. That is perfectly legitimate. Where we fully endorse it is the fact that as the electronic databases become more prevalent and the Aadhaar numbers become the lynchpin of thosedatabases, security and privacy is required. We have also been saying the same thing; we don’t disagree with that. We have written to the government about this, and the government has formed a group to look at a privacy and data protection law that is overarching. Privacy is not an issue with just us; it is an issue with many things such as credit cards and mobile phones. So rather than just saying we need a privacy law just for us, we need an umbrella privacy law which encompasses all these other uses. India Knowledge@Wharton: What are some of the expectations people might have that might be misplaced and not within the realm of Aadhaar? For example, what it can do to identify families below the poverty line? Nilekani: To identify whether a person is BPL or not is a business view that has to be implemented by the relevant [government] department head. But having Aadhaar numbers and linking benefits to our numbers eliminates duplication, and makes it more accessible to the poor where you can create an application, where somebody who is BPL can apply online or through the mobile phone for a ration card and you can have a list of people who have applied for it but not got it. That creates transparency about who have not received [their ration cards]. India Knowledge@Wharton: People might have expectations from Aadhaar that are based on misconceptions. Could you identify a couple of them? 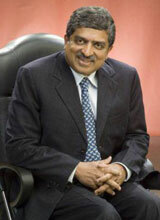 Nilekani: It is not a panacea. It will provide an identity infrastructure throughout the country. It will lay the foundation to reengineer public services — just the foundation. [But] it will be the responsibility of different agencies to reengineer the way they deliver services, to use this capability. And that is not in our hands. We are giving you a roadmap on how you can use this to improve the way public services are delivered, how PDS (public distribution system, for food and other essential supplies) can be reengineered, how NREGA payments can be made more efficient and so forth. Our charter is not to do that; our charter is to provide identity infrastructure. What we will do is, one, provide the ecosystem and the interfaces so that people can plug Aadhaar into their operations easily, so that they can build their own applications on it. Two, in a couple of flagship areas we will actually work on enabling them to happen. One is in the area of financial inclusion and the other is in the area of mobile subscriber verification. One of the big challenges we have is we have a nation of migrants — 120 million migrants out there — they don’t have an ID or their ID is not recognized; they may come from one village in one state and go to another city in another state. Giving them an ID and helping them to get a bank account or mobile SIM cards with that ID is definitely part of our agenda. We will actually be involved in that because that will be a good demonstration of the benefits of Aadhaar. India Knowledge@Wharton: Tell us a little bit about the person in you that is excited about this project. When you were appointed, did the government say why it picked you? Nilekani: Number one, the government seems to induct people it perceives as being capable — or something like that. The second thing is this project has sophisticated technology and my technology background makes me a good candidate. Third, I have written a whole chapter on this in my book [Imagining India, published in 2008] and they know I have an interest in this. The fourth is, in general I have been on the fringe of public policy for the last 10 years. So they know that apart from my business interests, I have an interest in public policy issues. And, when they asked me I was available. India Knowledge@Wharton: Could you go back 30 or 40 years — did you have stirrings of wanting to do something inpublic policy? Nilekani: I grew up in an environment where my family members, specifically my father and uncle were very public-spirited people. Perhaps that rubbed off on me. I was a general secretary at IIT-Mumbai. India Knowledge@Wharton: What is the one thing you have to get right with Aadhaar? Nilekani: Right now, our focus is on scaling up enrollment and at the same time maintaining high quality. And it is about cost, quality and scale — right? We have to enroll a billion people … at a low cost, but we have to do it without compromising our quality.